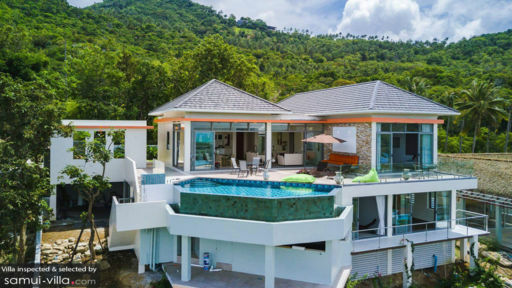 Villa Ying Yang is a hilltop home that captures the dense foliage, azure oceans and rugged coastlines of Samui perfectly. 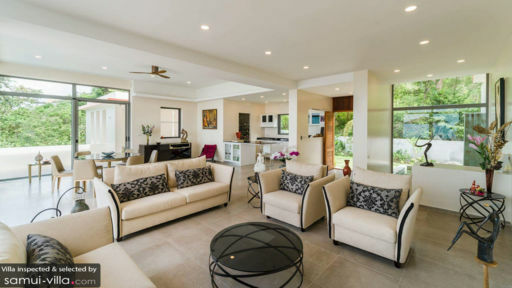 The highlights of the home are well placed for taking in the surroundings - like an infinity pool with uninterrupted sea views, dining area with island vistas and bedrooms that look out to abundant tropical greenery. Eight guests are comfortably accommodated in four bedrooms. The neutral colour scheme - featuring cream walls and earth-tone tiles - complements that colourful furnishings perfectly, with lime green bean bags, multi-colour bed linens, decorative wall ornaments and accent chairs with scarlet-hued cushion covers enlivening the interiors. Pull back the glass sliding doors to access a balcony with views out to the villa’s picturesque surroundings. All en suites are wonderfully appointed, and come complete with a vanity, toilet and shower recess. The master en suite stands out with features like generously proportioned interiors, double vanities and bathtub. The spacious grounds of Villa Ying Yang features an infinity pool and a sun-soaked pool deck outfitted with bean bags, recliners, sofa and al fresco dining set. With incredible views out to the island’s lush greenery, this is a focal point where guests gather for dips in the pool, sunbathing sessions and poolside libations. Stylish and contemporary are words that best describe Villa Ying Yang’s interior. The main living area is bright and airy, with glass sliding doors that open out to the pool deck. The open layout creates a seamless flow between the various living spaces; an indoor lounge furnished with cream couches and glass top coffee table extends out towards a dining area and open kitchen. The latter comes equipped with a full range of cooking amenities and essentials like a coffee maker. Gardening services and welcome drinks are included with your stay. Services available at additional cost include: airport pick-up, pool maintenance, vehicle rental, boat rental, private driver, electricity, laundry service and room service. 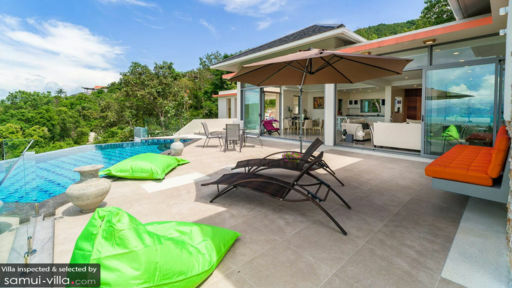 Villa Ying Yang is located in northern Samui, in the coastal town of Bophut. With its laidback atmosphere and a variety of local amenities and attractions within easy reach, the town is a great option for families travelling with young children. Bophut Beach, located about nine minutes’ drive from you villa is a popular hangout among families and expats thanks to the absence of girlie bars and a rowdy nightlife scene. Just a skip away from the beach is Bophut Fisherman’s Village, a hub peppered with upscale shopping and dining establishments. A rejuvenating holiday won’t be complete without activities like spa rituals and yoga classes. Six Senses Samui’s (24 minutes’ drive) incredible spa menu throws out ample options for indulgent treatments. While your villa manager will readily assist with organising in-villa yoga sessions, vacationers seeking the ambience of a group class will find drop-in classes at The Yogarden Samui (eight minutes’ drive) or Vikasa Yoga Retreat (20 minutes’ drive). Scheduling in time for cultural sightseeing is a must, given that the island is home to iconic attractions like the Big Buddha Temple. Round out your day with dinner at the atmospheric Spirit House Samui, where your evening will be rounded out with a traditional Thai dance performance. Both attractions are 17 minutes’ drive from your villa.